Over the last two weeks, the city of Osh in the south of Kyrgyzstan has been plagued by rumours about an imminent “revolution” or an “interethnic conflict.” Nobody knows who is disseminating them and what goals the initiators of this fear campaign are pursuing. Who is sending short messages?.. “Unidentified individuals are purposefully distributing different completely baseless rumours ahead of the [May] holidays. The ministry of internal affairs is administering rapid response and search activities. Several women were detained recently for disseminating rumours in the markets in Osh. Explanatory work is underway with the population in Osh, Jalal Abad and Batken Regions. Rumours about illegal activities are groundless as well. Officers of Main Department 10 under the ministry of internal affairs of the Kyrgyz Republic have recently detained two young men and a woman aged 17-25 who were disseminating various rumours via WhatsApp and social networks. Police officers are carrying out prophylactic interviews with them and appropriate documentation is drafted at this time. The material [pertaining to the case] will then be handed over to investigation bodies for juridical assessment. In order to maintain citizens’ security and prevent various illegal acts, internal affairs bodies of the Kyrgyz Republic have been put on a higher alert on duty during the May holidays starting on April 30,” the dispatched message reads. Short messages containing “warnings” that caliphate establishment supporters are stepping up activities and the local population ought “not to visit public spaces for their own safety” were indeed sent [to cellular phones in South Kyrgyzstan]. The warnings about the threat of extremists pose were coupled with allegations against the USA. “Dear friends, I have an urgent news. There is information that war will possibly ensue on May 7-8-9. America is secretly distributing weapons to the Hizb ut-Tahrir Party members. Be prepared for any situation. I request you forward this message to your friends as well, so they are prepared as well. Do not visit public spaces for some time,” reads in part a message of this sort. Such rumours have brought about a situation close to a panic among the local residents. According to vehicles master Ilkhom Razikov, many businessmen have moved their goods, including vehicles for sale, from the markets to their houses. “I heard many [businessmen] had their vehicles transferred from the market to their houses for security purposes. There are many rumours in the city that an interethnic conflict would take place again. That is why people are scared,” Mr Razikov told Fergana. According to local residents, the Osh police staged a complete checking of foreign citizens and vehicle with license plates of neighbouring countries. It is noteworthy that these inspections are taking place right in the beginning of the summer tourism season. Mariya, a Moscow native, arrived in Osh with her friends from Russia and Ukraine for the May holidays. 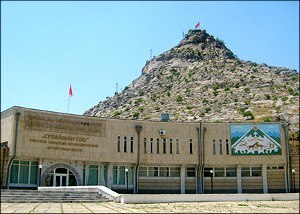 She told Fergana that the three of them were walking on the Solomon Mountain—a frequented tourist attraction in Osh—were they purchased local national headwear. As soon as they descended from the mountain, people in plainclothes emerged from a car parked nearby and introduced themselves as officers of a department for combating terrorism and asked to produce their documents. “We were then rudely seated into the car and would not return our documents. We were taken to a police station probably. We saw no signs on the building but the street it was on was Mamyrova Street. They interrogated us for over four hours between 1800 hours and midnight. They repeatedly asked strange questions: where we were from, why we were in Osh, what money did we use [for traveling], why we were there in such alarming times and what we were going to do. We responded that we are only tourists who arrived in Asia for the May holidays and have no knowledge of any ‘alarming times.’ The interrogation was administered in a very rude manner: my friends’ domestic passports were seized from them [by police] on top of taking their traveling passports away. They then started intimidating us, saying they could detain us there because we did not register [with local authorities upon arrival]. And I responded to that, saying that nationals of those countries who do not require a visa to enter Kyrgyzstan do not need to register. However, they continued intimidating us. They searched all of our things, although they did not inspect the contents of our cameras and notebook [computers]. There were two Brits at the station who had no clue as to what was going on. Closer to midnight, the tone of their voices changed and they became more composed in their behaviour. When a representative of our tourist operator arrived there for us, they simply let us go and provided no explanation for detention,” Mariya says. The person mentioned by Mariya above was Andrey [the name is changed], who is the owner of a tourism company in Osh. He said after his friends called him, police showed up at his door and checked the documents of his guests. They then took him to the police station where he saw other foreigners along with the guests he was there for. There were about 10 individuals some of whom were from the CIS, while others were Europeans. “They told they were pulled out of hotels and even cafes. Since late April, there are incessant rumours circulating in the city that another revolution is being prepared; everyone in the market and city centre is talking about it. The rumour had it disorders would break out on May 9, but now even the parade is over and everything is calm so far. Perhaps that is the reason so many police officers appeared in Osh and they are checking everybody who looks different from locals, however insignificantly,” Andrey continues. Even though the Osh secret services have refuted the rumours about destabilisation efforts, no explanation was provided as to the mass detention of foreign guests as of this writing. It is worth noting that such an attitude and treatment of innocent tourists and guests on the part of power-wielders may negatively impact the summer tourist season. Because Osh and South Kyrgyzstan in general are a popular place for outdoors sports enthusiasts.